In this post, archivist Anne Kumer shares some park history. This post also appears on NYC Circa, a history blog about New York City, its buildings, and public spaces. 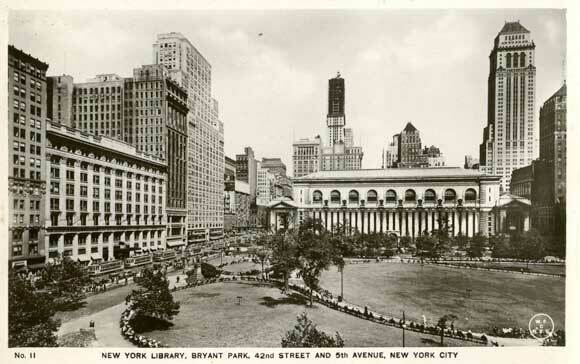 The photo below is one of the earliest I have on file of Bryant Park, and maybe one of the most interesting. 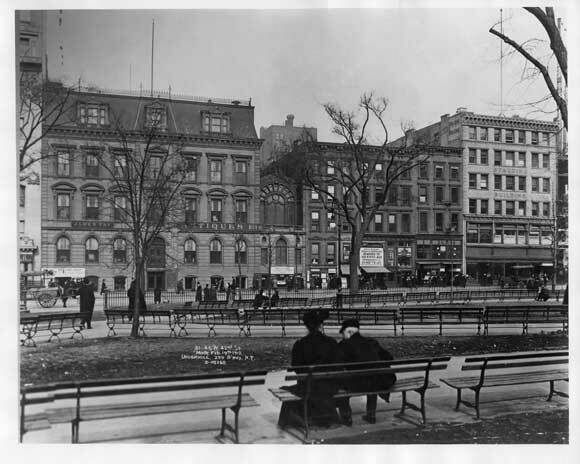 It shows West 42nd Street between Fifth and Sixth Avenues, about where the W.R. Grace building is now, and a zillion benches lining paths inside the park. All of those buildings have been razed and replaced, and in many cases, their replacements replaced. It was taken in 1912, one year before the Stern brothers built a large flagship store in about the same place on the block. This postcard, most likely of the park between 1913 and 1917 (after Stern's was built, but before the Eagle Hut and Victory Garden), shows the same stretch of West 42nd Street, a pre-Chrysler building skyline, and offers further evidence of park bench enthusiasm. The building still stands, but now houses a Home Depot that only seems to stock house paint, potted plants, and light fixtures. (If you need actual tools or hardware, venture to the outer borough locations.) Still, it's a pleasure to shop in because of natural light afforded by the huge windows and open floor plan. In 1913 the company moved from this location to build a new flagship store on West 42nd Street, across from Bryant Park, where it would remain for many years. That building was nine stores tall, with a separate entrance for those wealthy enough to be in the know. 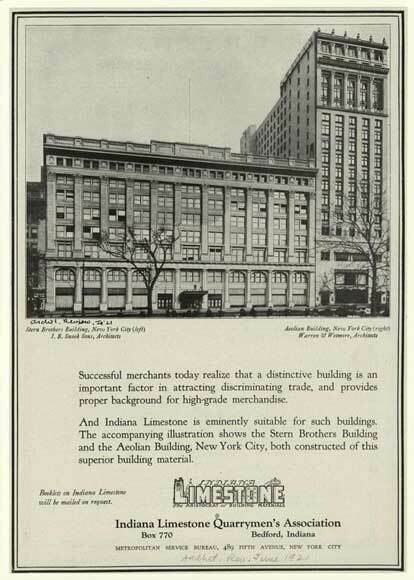 The new building was a big enough deal for the Indiana Limestone Company to use it and the neighboring Aeolian building in a 1921 advertisement for their product. 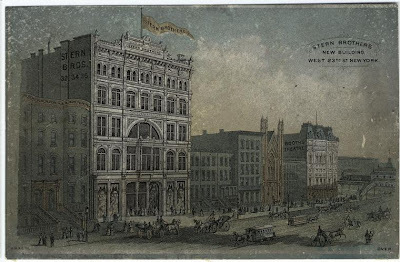 The Department Store Museum has a complete listing, and other useful Stern's info. By the late 1960s the sales in everything had declined significantly. The flagship store was moved to Bergen Mall in New Jersey, taking with it, West 42nd Street's status as a retail center. The building was sold and torn down to make room for the Grace Building, built by the W.R. Grace Chemical Company, and designed by Gordon Bunshaft of Skidmore, Owings, and Merrill Architects (SOM). Construction started on the Grace building in 1971, and was completed in 1974. It is one of two buildings in the city to have a sloped facade. 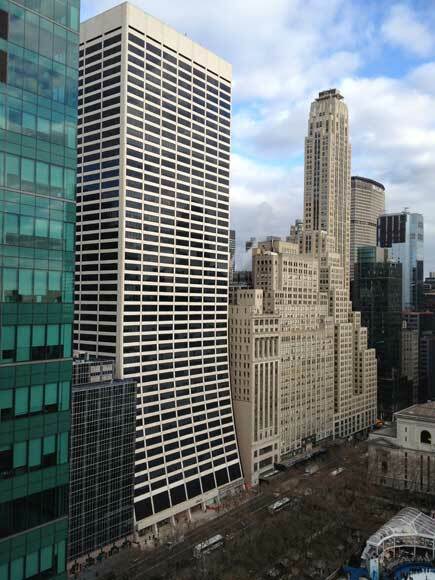 The other, also designed by Bunshaft is the Solow building. The design of the Grace building is rumored to come from the rejected sketches of the Solow building facade. Though retail still exists on the ground floor of most of the buildings on this block, I doubt any have a fireplace department. To read more about The Stern Brothers' former locations, click here.